Each bottle stopper favor measures 4" x 1" x 1.5" and is made with a sturdy chrome base wrapped with a black rubber gasket. 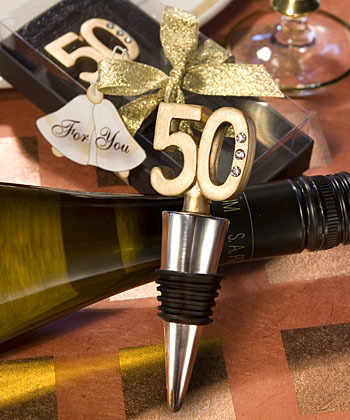 It features a bold gold three dimensional "50" tops it off, delightfully embellished with three shimmering rhinestones. Each gift comes attractively packaged in a deluxe clear topped box with a black base, tied with a gold organza ribbon and attached wedding bell shaped thank you tag.